Come Party in Pittsburgh At #SPNPitt! We were planning on sitting this one out and enjoying a nice, quiet weekend at the Random Acts lair—I mean “offices”—but we just couldn’t stay away. 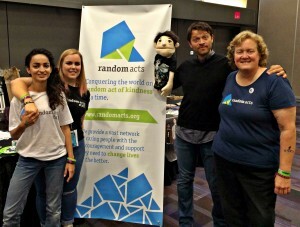 That’s right: On Saturday, July 9, RA Director Cinde & Friends™ will be in attendance at Creation Entertainment’s Official Supernatural Convention in Pittsburgh, Pennsylvania (#SPNPitt) to spread some kindness and have a good time, and they’re hoping you’ll join in on the action! If you’ve never visited us at one of Creation Entertainment’s conventions, we hope you’ll come say hello and meet all of the rest of our wonderful supporters, who never pass up the opportunity to lend a hand or donate to the local charity with which we’ve partnered. This time around, Cinde and the team will be joining forces with the Pittsburgh-based nonprofit Beverly’s Birthdays, collecting donations for some special children. 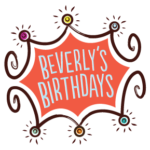 Beverly’s Birthdays provides children who are homeless or whose families are in need of a little assistance the opportunity to have their very own birthday celebration each year — something they otherwise might not get, given their respective circumstances. The charity was founded officially in February 2012 and received 501(c)(3) status in August that year. In 2015 alone, through the generosity of donors and advocates, Beverly’s Birthdays raised nearly $286,000 and provided 281 children with a memorable birthday celebration. With that same funding, the group was also able to distribute birthday gifts to some 1,093 children and delivered 975 birthday bags to families in need. How can you help Beverly’s Birthdays over #SPNPitt weekend? **Please no toy weapons (Nerf guns, air soft guns, plastic swords, plastic knives, etc.). I’m not attending #SPNPitt! How can I get involved? That’s easy! Just make sure to join in on the festivities from afar, tweeting out the various ways you’ll be getting kind that day for your own community, and include the hashtags #GetKind and #SPNPitt. We can’t wait to see what you do! Are you ready to do some good and have a great time over the big #SPNPitt convention weekend? We know we are! Make sure to follow along on our various social media channels throughout #SPNPitt weekend, in order to make the most of the big convention! Tune into our director’s Twitter feed (@RADirector), or follow along on our general Twitter channel to get occasional updates throughout the day!